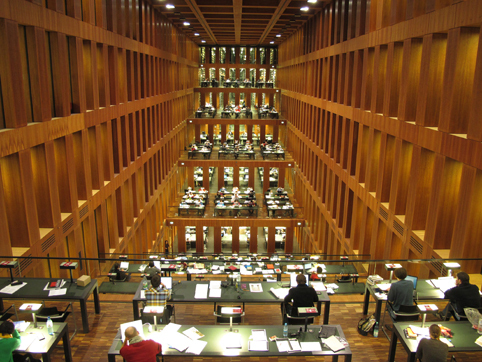 Founded in 1831, the Humboldt-University library is the oldest university library of Berlin. From early on, it was granted the right of legal deposit concerning the publishers based in Brandenburg and Berlin, which expired in 1972. The holdings were not badly damaged during the two World Wars. Therefore, the historical collection concentrates on books dating from 1850 to 1945. For the purpose of the expansion of the old books collection, specific erudite libraries have been acquired: for example 6,000 volumes of books from the former Jacob and Wilhelm Grimm's private library, parts of Wilhelm von Humboldt's philological library (250 volumes) and the Theodor Schmalz collection. Other treasures of the main library are parts of the former Prinz Oskar von Preußen's library and the abundant collection of lecture notebooks (about 50,000 titles). The branch libraries also hold important collections such us the former library of the 'Gesellschaft der Naturforschenden Freunde zu Berlin', founded in 1773 (nearly 1,000 books) and the former August Wilhelm von Hofmann’s private library (about 8,000 books). August Wilhelm von Hofmann founded the first chemical institute in Berlin. The humanities branch libraries possess important collections of material based on gatherings from the art history department. There are a total of approximately 6 million volumes in the holdings of the Library.